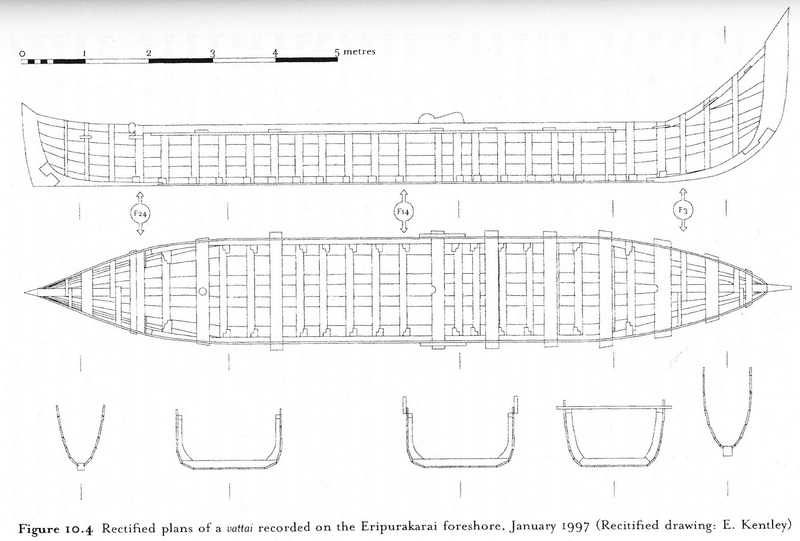 Examples of traditional frame-first boat construction in Asian cultures are rare. Throughout the Far East, Middle East and east Africa, shell-first construction of planked boats is the norm, where it is used for everything from sampans and junks to dhows. One of the few exceptions is the vattai, an open, sail-powered, flush-planked (carvel) fishing boat common in the state of Tamil Nadu, in India’s southeast. The vattai is described by Lucy Blue in “The Historical Context of the Construction of the Vattai Fishing Boat and Related Frame-First Vessels of Tamil Nadu and Beyond,” published in Ships and the Development of Maritime Technology in the Indian Ocean (David Parkin and Ruth Barnes, editors; Routledge, 2016). The information and images in this post are from that article. "Vattai, are flat-bottomed, have a box-like transverse section and are near wall-sided over much of their length. They range in size from around 13.72m long, with a beam of 2.13m and a depth of 1.37m, to the smallest vessels of c. 5.18m x 1.07m x 0.76m. However, irrespective of their size, they are all similar in shape with very high bows, and two or three masts each with a settee-lateen sail, a balance board, and, uniquely on this coast, leeboards." The design process is of much interest. A single mould form or template is used to lay out most of the frames on a scrieve board, the form being flipped to draw the port and starboard half-breadths. 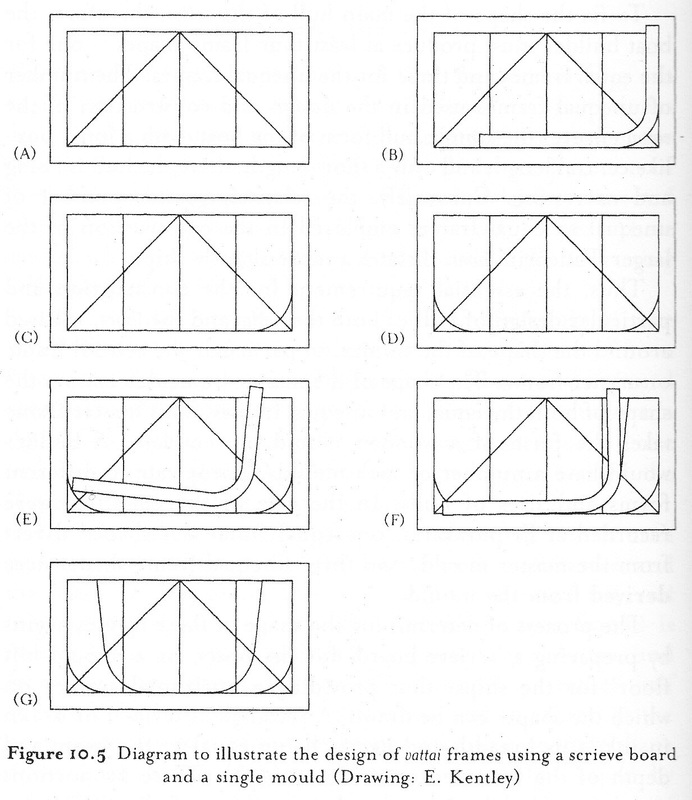 (Forms for different boats differ from one another, apparently, only in the radius of the curve that joins their two straight, right-angled legs.) Since the boat’s cross-section (half-breadth shape) is constant across its entire midbody, a single shape drawn on the scrieve board suffices to define most of the frames, and this follows the exact shape of the form laid square to the edges of the scrieve board. 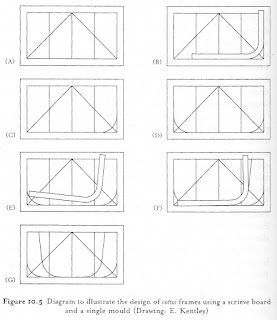 Use of the mould form and scrieve board (A) to create the shapes of the "equal" frames for the midbody (B,C,D), and the progressively narrower frames toward the ends (E, F, G). Fore and aft of the “equal” frames that constitute the midbody, each of the next three progressively narrower frames at the bow has an identical counterpart in the stern. These frames that define the ends are derived from the same mould form according to a formula that defines how far in from the scrieve board’s upper edge and how far up along the diagonal the form is placed. By rotating and raising the form, different frame shapes may be drawn to create the narrowing and flare of the hull’s ends. The final three frames in the very bow and stern, however, are not drawn or gotten out at this time. 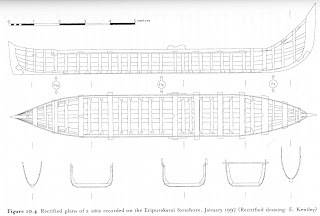 In the boat recorded by Blue, there were 15 “equal” frames for the midbody plus 12 “unequal” ones, evenly divided between the bow and stern. The midsection always consists of an odd number of frames – the central master frame, and equal numbers of identical frames fore and aft of it. The design can be readily made longer by the addition of more equal frames in the midbody with no changes to the ends, and made wider starting with a wider scrieve board but using the same mould form. Rules of thumb establish ratios between length, breadth, depth, and frame spacing, so the builder’s discretion to make changes is limited mainly to his choice of the mould form and number of frames. I would also much like to see additional photos. 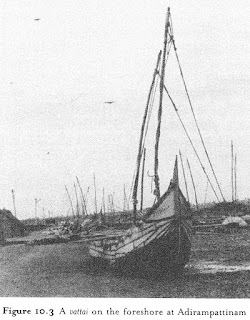 Google image searches for terms like “fishing boat Tamil Nadu” yield a number of stock photos of open fishing boats that do not appear much like the vattai (the distinctive bow shape is an easily-noticed identifying characteristic), and nothing else even close. Please communicate in the comments if you can add to the discussion. Header photo: sewn-plank canoe in Kerala, India. Copyright Paul Wilson, used by permission.